Throughout the 1990s, there became a trend of horror games aiming to replicate the experience of watching popular genre movies. As 3D graphical technology improved, developers were using additional methods to build the atmosphere than improving visuals or composing music. It soon became important for them to realise that control schemes, animations, and - most importantly - camera placement would become an essential part of the adventure game formula. 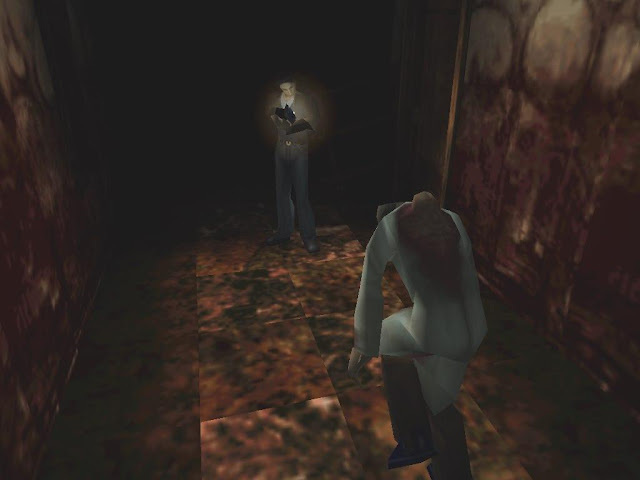 While not fully in 3D, the 1992 Infogrames' adventure title Alone in the Dark was one of the first survival horror games to utilise such graphics. Depicting a haunted mansion populated with supernatural enemies and perplexing puzzles, the game combined pre-rendered backgrounds with real-time 3D polygon models for its environmental design. This, combined with its use of fixed camera angles meant that the game's aesthetic aimed to replicate classic horror movies, particularly the works of Alfred Hitchcock and Stanley Kubrick. Tight corridors and elevated angles were deliberately placed to make the protagonist appear weak. Resident Evil was released by Capcom in 1996 and continued the technique that began in Alone in the Dark, with the game also using tight camera angles and a moody lighting system to illustrate the dangerous horrors of the Spencer Mansion. Because of the game's real-time combat system, its cinematography was deliberately set up to induce a feeling of tension in the player when certain enemy encounters were triggered. During the first encounter with a zombie in Resident Evil (pictured above), the player's initial reaction may be to move away from the enemy and create some distance between them. By doing so, the camera is deliberately moved in order to hide the zombie offscreen, creating tension and a sense of dread as the living corpse shambles towards you with its exact location always being unknown. This idea of a visual restriction reinforced our vulnerabilities as players which led to an overall more effective horror experience. This leads to me to Silent Hill. While I arguably consider Resident Evil to be a more effective horror title than Silent Hill, I also believe the latter played a huge role in developing the genre and how we perceive and use videogame cinematography. Unlike Spencer Mansion's tight corridors and claustrophobic living spaces, the town of Silent Hill is open and free to explore. The player has more room with which to move and can avoid enemy encounters should they wish to. Despite being based on the very familiar image of an American midwestern town, the environment still ends up feeling alien to the player due to the presence of a heavy mist and run-down abandoned buildings. While most of these stages employ a traditional third-person camera perspective, Team Silent also use the fixed-camera technique in areas where the tension needed to be ramped up. There's a moment very early in the game where protagonist Harry Mason searches for his daughter Cheryl and enters an alleyway that gradually gets darker as an air raid siren alarms in the background signalling the shift to another dimension. As the scene gets more twisted and he discovers a corpse strung up onto a wired fence, several monsters attack and wound him. The actual tension came not just through its disturbing audio or graphic content, but by how the camera angle changed from that traditional third-person perspective to a top-down, claustrophobic view, designed to make Harry look small and powerless while also hiding the path ahead from view. As the player progresses through the game, there are also many more moments where the camera is used to play for tension. 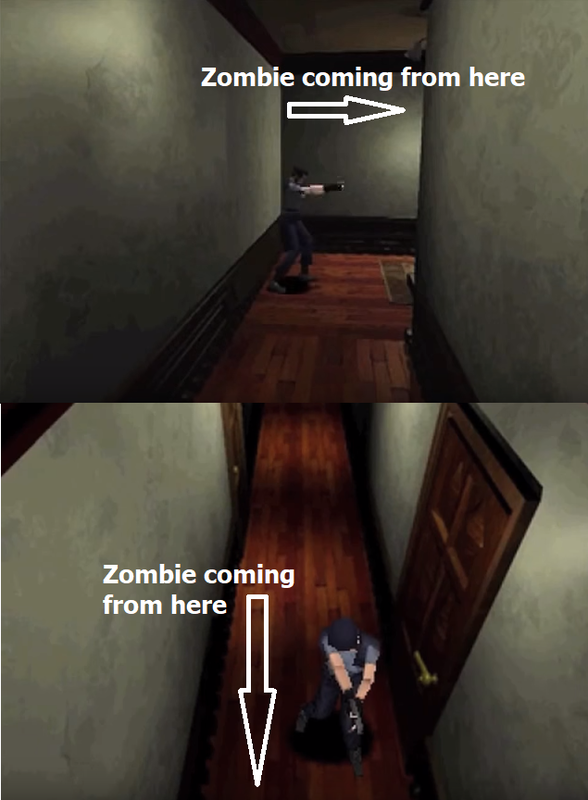 In areas like the school or the hospital, many enemies are concealed in darkness off-screen, similar to the placement seen in Resident Evil. The difference here is that sound becomes more of a factor in increasing the tension. Harry carries around a radio that emits a static noise to alert him to nearby enemies, and nine out of ten times they will be heard before they are seen. The distress is then amplified by the fact that the player will not know what enemy type is nearing, and thus cannot fully prepare for the encounter before learning what is approaching. 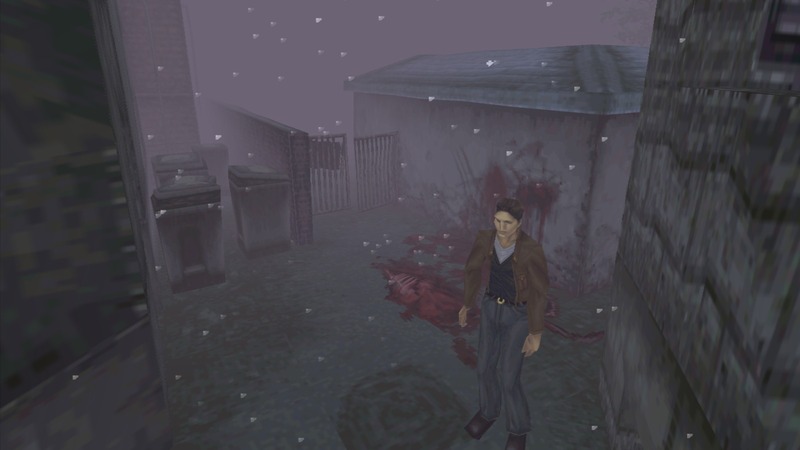 Using the atmosphere of the town as the main source of horror was a conscious decision made by the design team in order to add to the dark mood of Silent Hill. In an interview with Official PlayStation Magazine in 1999, game director Keiichiro Toyama said about the use of cinematic camera angles: "we wanted to focus on the technology, to create this world in full polygons with a free-floating camera that changes a lot to keep the player really unbalanced, and to use a lot of fog effects and lighting effects. In order to give the game a feeling of a real world, but an unbalanced world, we took influences from David Lynch, Cronenberg, that cinematic style." There's no denying that both Silent Hill and Resident Evil ended up becoming a prime source of inspiration in the horror genre. Games like The Evil Within, Darkwood and Simulacrum have all borrowed aspects from the two series, using the developers' dedication to designing using the player's reaction to darkness and offscreen threats as a design principle. The camera is often an underutilised tool in third-person games, but more horror developers can look to Silent Hill and Resident Evil as influence with this simple but effective mechanic.